Some yarns, especially those with mixed colours over long stretches, look so good in the skeins but it’s not easy to capture that beauty into the knitted object. Duo has long stretches of one colour before changing to the next one and I wanted that to show. So I came up with this domino knitted shawl where each square will be different from the next one depending on where in the yarn I am while starting the square. The Morrighan is the Celtic goddess of death and war and she can be seen as a crow or raven flying over the battlefield. She is also a goddess of passion and are often depicted in black and red. Her time of the year is the beginning of November when the earth gets to rest for the winter. This is a large shawl for snuggling up in during that time. Järbo Garn Duo is a multicoloured yarn with reds varying from cherry black to strawberry pink. The colour reports are very long so it will take many squares before the same colour returns. If you can’t find a yarn with this colour pattern I suggest that you try and do it in different solid colour reds or with a thinner yarn and two strands of different colour reds held together for greater variation. p-sl1p-s – purl 1, slip 1 purlwise, put both stitches back on the left needle, slip the second stitch over the purled stitch and put the purled stitch back on the right needle. The shawl is made up of individually knitted squares started at the tip of the shawl and worked upwards towards the shoulders. The squares after the first one is made by casting on stitches for the edge and picking up stitches from the previous square. Triangles form the line at the top edge. A short circular needle will probably be the most comfortable to use for the squares and triangles. The placement of the squares should be varied according to the coming colour on the skein so that very similar colours do not end up at the same place. Compare the skein to the squares and make a square where it contrasts to the surrounding squares. 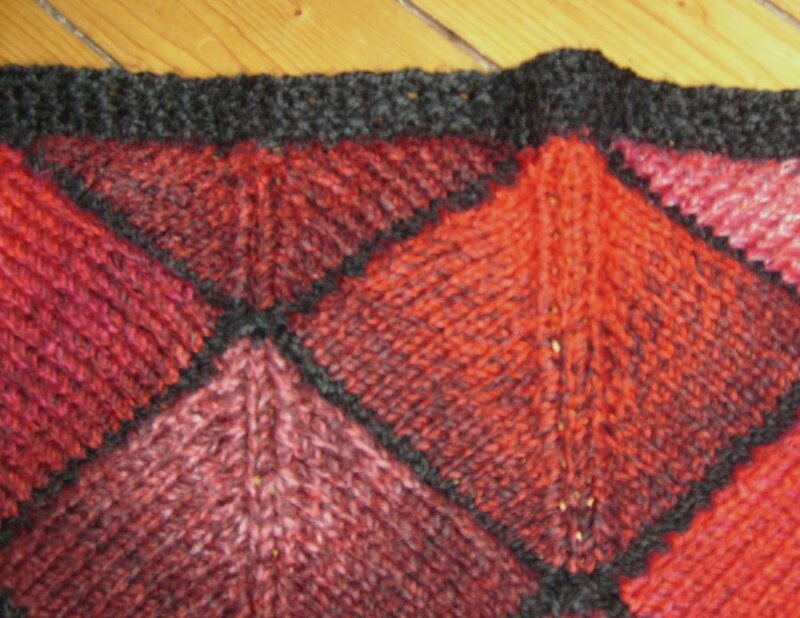 Make 78 squares and 13 triangles for a really large shawl or stop earlier for a smaller size. The first row after casting on/picking up stitches is always purled from the wrong side. The first st on every row is always knit (unless slipped for decreases). First square: With Järbo Garn Vinga (black), cast on 39 st with one stranded cast on technique. Squares at right edge: With Järbo Garn Vinga (black), pick up 19 st at the left side of the in the previous row of squares and continue by casting on 20 st with one stranded cast on technique (= 39 st). Squares in the middle: With Järbo Garn Vinga (black), pick up 19 st from left side of the square from the previous row, pick up 1 st from the top of the square between the ones from previous row, pick up 19 st from the right side of the square from the previous row. Row 25: sp2p (= 1 st), break of yarn and pull the end through the last stitch. Triangle at left edge: With Järbo Garn Vinga (black), pick up 1 st from the top of the square between the ones from previous row, 19 st at the left side of the in the previous row of squares and continue by casting on 20 st with one stranded cast on technique (= 40 st). Triangles in the middle: With Järbo Garn Vinga (black), pick up 1 st from the top of the square between the ones from previous row, pick up 19 st from left side of the square from the previous row, pick up 1 st from the top of the square between the ones from previous rows, pick up 19 st from the right side of the square from the previous row (= 40 st). Observe that there is one picked up stitch between the triangles which makes the total number of stitches 40 for the middle and left side triangles. These stitches are not knit but will be left for the top edge. 2 stitches are left on the needle at the first turn on these triangles. The triangles are made by doing short rows on the middle of the squares. Each row is 1 st shorter than previous row at each end before the turn. Leave the unknit stitches on the needles and transfer all of the stitches to a strand of yarn or knit picks cable when finished. Row 12: sl, k 1. Transfer all stitches to one of the needles and then put them on a strand of yarn or cable needle until all triangles are finished. Put all the saved stitches from the triangles on a long circular needle. There’s 23 st/triangle + 1 st between the triangles (= 311 st for 13 triangles). Using Järbo Garn Vinga (black), start at the Wright side. Row 3: k, *p1 k1* to end. Row 4: k all p st, p all k st (moss stitch). Continue with moss stitch for two more rows. Cast of in moss stitch. Fasten all threads from the squares and triangles. Block or press lightly (follow directions for the yarn). Start at the top corner and do one row of crochet around the tip up to the other top corner. Cut double lengths of fringes (fringe length ca 15 cm) from ribbon yarn and cotton bouclé yarn (or other yarn of choice). Add the fringe to the crocheted edge. The fringe could also be made up from different sorts of black waste yarn. Maker sure that you mix them so that the various sorts get spread fairly evenly over the entire fringe. The shawl is beautiful. Thank you so much for offering the pattern for free. Your work introduced me to a new line of yarn…thanks so much. Just beautiful! I love the way the technique displays the yarn coloration. It is going on my list of TO Do’s! Would you please check the instructions for casting on for triangles for the Morrighan Shawl. Triangle at right edge and Triangles in the middle both require 40 stitches, not the 39, which I think is supposed to be the correct number. I would appreciate it if you would e-mail me privately with the correct instructions. Love this pattern and recommended yarn!! All triangles except for the one which starts with casting on before picking up requires 40 stitches. The extra stitch is just there for the edging and is never knitted. You leave 2 stitches at the end of the first row on the wrong side instead of one as you do on every other row. When you’v finished knitting your triangles you should end up with 23 stitches/triangle plus 13 stitches that is between the triangles a the top edge (the extra picked up stitch). So the number is correctly written. Thanks for asking so I could clarify this part of the pattern. Beautiful! I have some Barefoot Mountain that I’m dying to work into a shawl. I think this may be the perfect pattern!! Åh Caroline vad vacker den blev! Men det kunde jag ju redan se när jag var på besök, du är verkligen en konstnär! 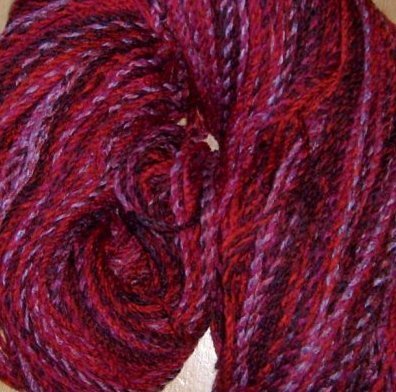 This is a simply beautiful pattern for this particular yarn. It jumped to the top of my (enormous)queue the moment I laid eyes on it! I have finished about half of the squares and have started the top triangles. Is it possible that there is a number missing in Row 4 of “Rows for Triangles”? Do you not knit 11 stitches just before you turn and go back? You are right, there was a number missing. Thank you for pointing it out to me! I have corrected it now. And thank you for your words about my pattern. 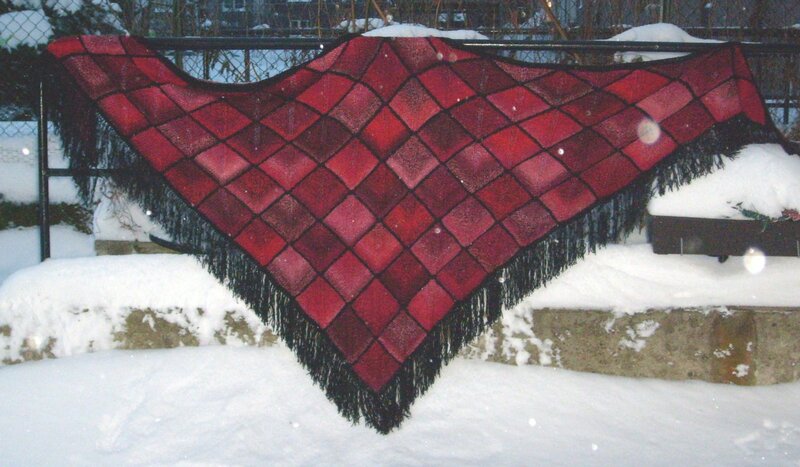 If you are on Ravelry I hope you will publish pictures so I can see how our shawl turned out. Thanks again and merry knitting! Hi. Could you please explain the cast on, “one stranded cast on technique” Cant find any videos with that technique. A “one stranded cast on” is a cast on where you use only one strand and not two, as in the common long tailed cast on (korsuppläggning på svenska/Swedish). There are several ways to do it and several names for it but try searching for “knitted cast on” if you can’t find a good explanation in a knitting book. The reason for the “one stranded cast on” is that you have t do it after the pick up of the stitches from previous squares and then you are stuck with one strand to do it with and can’t use two. Hej Carolin. Vilken underbart vacker sjal. Gör verkligen garnet rättvisa. JAg undrar lite över uppläggningen. Har inte hittat någon med det namnet på nätet, vad heter den på svenska? Jag svarade på engelska ifall det är fler som undrar över uppläggningen. Hoppas du förstår vad jag menar, annars är det bara att fråga igen så ska jag försöka att vara tycligare. Tack för din uppskattning av min sjal! Thank you for this pattern, I have just finished my own variation on this – knitted with natural colour pure wools. I made two of these triangular shawls and then sewed them together along half of the long edges. Gives a square that is open from the centre to a corner so when you put it on you have the four corners going down each arm and front and back (hope that makes sense). Anyway, my shawl would never have happened if I hadn’t seen this one which started me thinking and showed me how to make it so thank you for sharing!